Opening - 250mm Depth - 150mm.. Opening - 250mm Depth - 160mm.. Opening - 300mm Depth - 130mm.. The most versatile sliding arm clamo on the market. 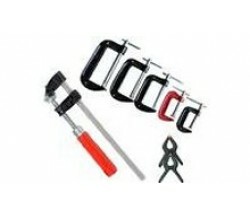 The strong, economical 4-in-1 clamps adapts to .. Opening - 100mm Depth - 85mm.. Opening - 150mm Depth - 100mm.. Opening - 200mm Depth - 130mm..
C Clamps with Swivel Pads 11"
Ideal for Automotive and Woodworking Applications where long reach Clamping is required. Partiularl..
C Clamps with Swivel Pads 18"
Capacity 200mm Wide opening jaws provide greater versatility in clamping a variety of shapes. Swiv..
C-Clamps with Regular Tips 275mm/11"
Capacity - 100mm. Turn screw to adjust pressure and fit work. Regular Tips (non-swivel) Wide open..
C-Clamps with Swivel Pads 100mm/4"
Capacity 41mm Wide opening jaws provide greater versatility in clamping a variety of shapes. Swive..
C-Clamps with Swivel Pads 150mm/6"
Capacity 54mm Wide opening jaws provide greater versatility in clamping a variety of shapes. Swive..
Capacity 112mm Wide opening jaws provide greater versatility in clamping a variety of shapes. Swiv.. Opening - 250mm Depth - 120mm.. Opening - 300mm Depth - 140mm..
Quick Grip Clamp & Spreader 14"
Opening - 300mm Reverse Opening - 195 - 450mm Depth - 75mm..
Quick Grip Clamp & Spreader 18"
Opening - 450mm Reverse Opening - 195 - 640mm Depth - 75mm..
Quick Grip Clamp & Spreader 24"
Opening - 600mm Reverse Opening - 195 - 790mm Depth - 75mm..
Quick Grip Clamp & Spreader 36"
Opening - 900mm Reverse Opening - 195 - 1100mm Depth - 75mm..
Ratchet Action High Pressure Clamp 10"
Specially designed ratchet action mechanism ensures rapid clamping and vibration and torsion resista.. The most versatile sliding arm clamp on the market The strong, economical 4 in 1 clamp adapts to se..
Capacity - 318mm Throat - 140mm Rail Size - 30 x 14 Clamping Pressure - 1100Kg Thread Hole - M10.. Vise Grip Sheet Metal 200mm/8"
Throat Depth - 44mm. Capacity - 78mm Locks to work with powerful grip. Perfect for sheet metal wo.. Vise Grip Welding Clamps 225mm/9"
Throat Depth - 25mm. Capacity - 70mm U-shaped jaws for visability and working space. Holds work i..